Zamboanga Sibugay Governor Rommel Jalosjos, Former Representative Romeo Jalosjos, Zamboanga del Norte Governor Rolando Yebes, Education Regional Director Walter Albos and Assistant Regional Director Sharif Adzhar Sarahadil. DAPITAN CITY, Philippines (Mindanao Examiner / Mar. 20, 2011) – Filipino Education Secretary Armin Luistro said he would release some P200 million to support the upcoming Palarong Pambansa in Dapitan City in the southern province of Zamboanga del Norte. Dapitan, this year’s host to the sports festival, is one of the most beautiful and peaceful cities in Mindanao. It is the favorite destination of local and foreign tourists because of its pristine beaches, cultural heritage and outstanding peace and order in Mindanao. It is also home to the Philippines' version of the Walt Disney and the world renowned Dakak beach resort. 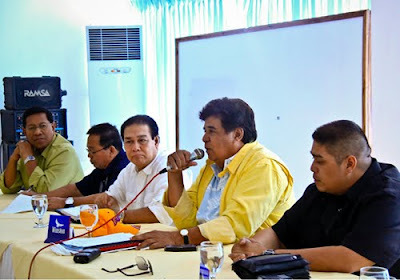 Some 20,000 delegates are expected to arrive in Dapitan in Western Mindanao for the games, said Zamboanga del Norte Governor Rolando Yebes, who recently met with Luistro about the Palarong Pambansa.